Your back pain can cause all sorts of problems – whether you have issues getting comfortable while driving or reaching for an item above your head makes you cringe in pain, we know that back pain can ruin your day. As bad as ruining the day is, back pain can really mess up the night, as well. When your pain prevents you from getting a good night’s sleep, you will feel the effects in all aspects of your life. Here are a few ways to work around the pain and get the rest your body needs in order to keep you functioning and healthy. Just as some positions feel better on your back during the day, so too will others feel more soothing as you attempt to drift off to sleep. It’s important to find a sleeping position that works best for you. Try sleeping with a pillow either between your legs or underneath them for some additional support if needed. For those of you who are side sleepers, we recommend putting the pillow between your knees and pulling them slightly upwards toward your chest. For back sleepers, put the pillow under your knees or roll up a towel and place it under the small of your back. 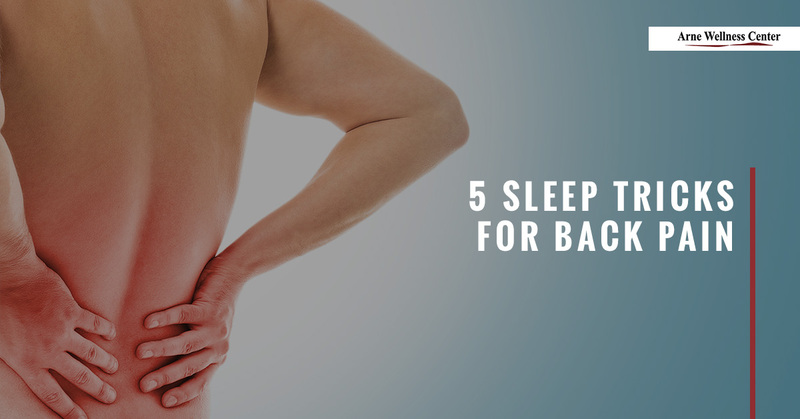 Regardless of how you sleep, it’s important to do your best to avoid sleeping on your stomach, This strains your back! If this is the only position you find yourself able to sleep in, then place a pillow under your stomach to alleviate some of the pressure on your back. Mattresses come in all shapes, sizes, and degrees of firmness. The type you need depends on your body type, so keep that in mind as you shop for a new bed to support you. If you have hips that are wider than your waist, then it may be better to choose a soft mattress. It will allow you to keep a straight spine as you snooze. However, if your hips and waist are evenly sized, then a harder mattress may feel as though it will give you more support. Back in the day, all doctors recommended solely firm mattresses, but over the years, we have found that those with lower back pain usually sleep much worse on hard mattresses than they do on softer ones. Be cautious of overly soft mattresses as well – you may sink in too deep and twist your joints to cause more pain. The best way to find the ideal mattress type is to test a bunch of them. You can see which types feel best, as well as assess how much support you’ll need. This goes for leaving your bed, too. Bending forward at your waist or moving too quickly can actually lead to more back pain. Instead of leaping into bed, take your time! Sit on the bed, swing your legs up, then lay down. Just reverse the motions when it’s time to get up in the morning by using your arms to help push yourself up. A strong core can minimize the potential for muscles or discs in your back to slip out of place, so a strong core is a great way to prevent back pain and muscles spasms from happening in the middle of the night. Also, regular physical activity will allow you to have more restful sleep. To strengthen your core, simple exercises can do the trick! Holding a plank pose for 15 to 30 seconds every day can help you practice engaging your abdominal muscles. Whether you choose yoga or another stretching regimen, studies have shown that stretching before bed can help reduce lower back pain, as well as lower stress levels. We recommend reaching out to your doctor to ask which positions are safe for you to try, as well as which ones will likely make your back pain worse. Feel free to try gentle stretching at home; however, if you are interested in learning more about yoga and proper breathing techniques, look into joining a class! If you would like more ways to alleviate your back pain, it may be time to contact a chiropractor who can help. Arne Wellness Center is here to help you manage your pain, as well as move towards a more pain-free life. Contact the professionals at Arne Wellness Center for your appointment today!